After graduating from OSU with his master’s degree in 2012, O’Kelly secured a job with Priority Designs, an industrial design firm based in Columbus, Ohio. He says that his Solar Decathlon experience was a major reason he got the job. 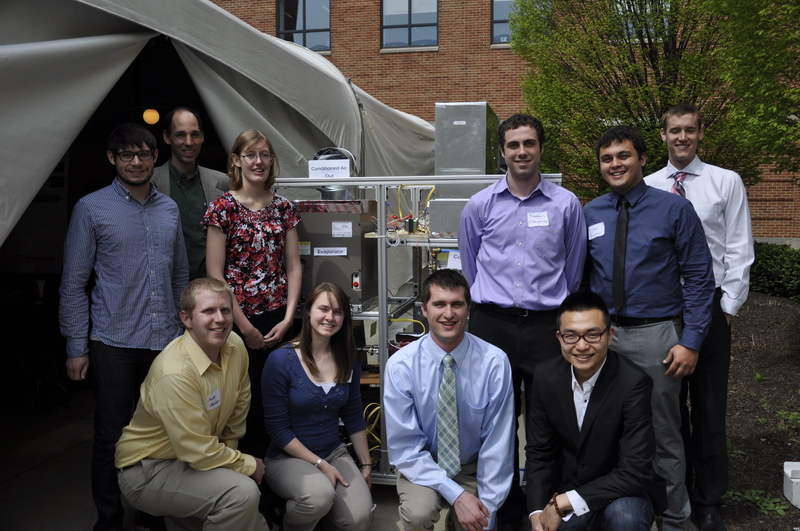 The 2012 energyhawc capstone team included (back row, from left) Matthew O’Kelly, Dr. Mark Walter, Marcy Kaercher, Brendan O’Shaughnessy, James Rowland, and Chris Schleich, (front row, from left) Scott Heckler, Sarah Weals, Lee Trask, and Fandi Peng. Photo courtesy of Matthew O’Kelly. O’Kelly explains that energyhawc (“hawc” stands for “hybrid air water conditioner”) integrates air conditioning, heating, water heating, ventilation, and de-humidification in one appliance and is up to 50% more energy-efficient than other whole-house conditioning systems. At 33 in. wide by 44 in. long by 60 in. tall (including the water tank), energyhawc is about the same size as a traditional central air-conditioning unit. Walter and O’Kelly created energyhawc as a modularized, more efficient implementation of the separate sensible and latent cooling concepts they experimented with in their 2011 competition house. Recently, O’Kelly and Walter won a $100,000 Ohio Third Frontier Startup Validation Fund grant to continue commercializing energyhawc. They have also brought on board James Rowland, a former capstone team member and current OSU master’s student. In June 2014, the OSU Technology and Commercialization Office submitted a utility patent application. O’Kelly, Walter, and Rowland are now working on a third prototype. Solar Decathlon alumnus Matthew O’Kelly stands on the University of Pennsylvania campus in Philadelphia. O’Kelly is part of a team that has developed a patent-pending technology that began with the Solar Decathlon 2011 OSU house. Photo courtesy of Matthew O’Kelly. 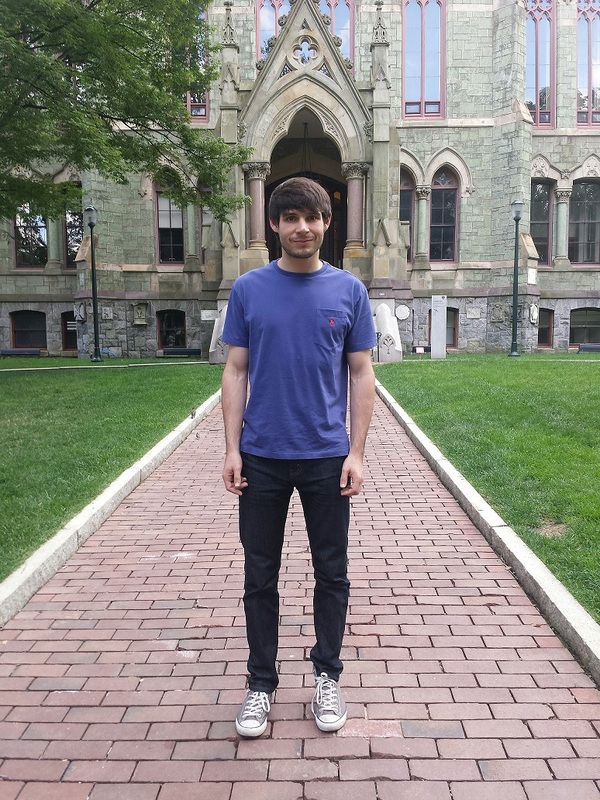 Although O’Kelly will continue to work with Walter and Rowland on energyhawc, he’s about to begin the next step in his professional career at the University of Pennsylvania, where he will be a doctoral student in electrical and systems engineering. He intends to shift his focus from product design back to research on embedded systems and controls, but he still plans to keep energy, infrastructure, and sustainability at the forefront of his career. This entry was posted on Wednesday, August 27th, 2014 at 12:01 pm and is filed under Ohio State, Profiles, Solar Decathlon, Solar Decathlon 2009, Solar Decathlon 2011.